Cook potatoes for 2 whistles and mash well. Grind the green chutney and add few drops of lemon juice. Soak tamarind,kajur & red chilli for sometime in 1 cup water and boil themand after it becomes soft,grind it to a smooth paste by adding jeera powder, sont and jaggery. Heat this grounded paste by adding water and bring it to a boil.allow it to cool. Heat oil in a pan and add hing,then dabeli masala,red chilli and roast for 2 minutes.aroma comes out. Then add mashed potatoes,water& add salt.Mix well and after the water evaporates switch off the gas. Take pav cut it horizontally but not fully(inside 3/4th).Spread green chutney on one side and kajur imli chutney on the other side. Then add roasted peanuts,then onion,coriander leaves,pomegranate,cut grapes into 2 and put that. Heat tawa and spread butter and toast this and after its toasted coat or dip them in sev. Note: i didn't use pav as its very small & my family members doesn't want the stuff to come out.so i generally use long size roll bun or plain sandwich bread.Quantity of the ingredients on topping varies from person to person. Could you please explain what is dabeli masala? Or give and alternative, this would make it easier for those wanting to try the recipe. Thanks. Dear Rabz,this is a maharashtrian one and really tastes awesome. 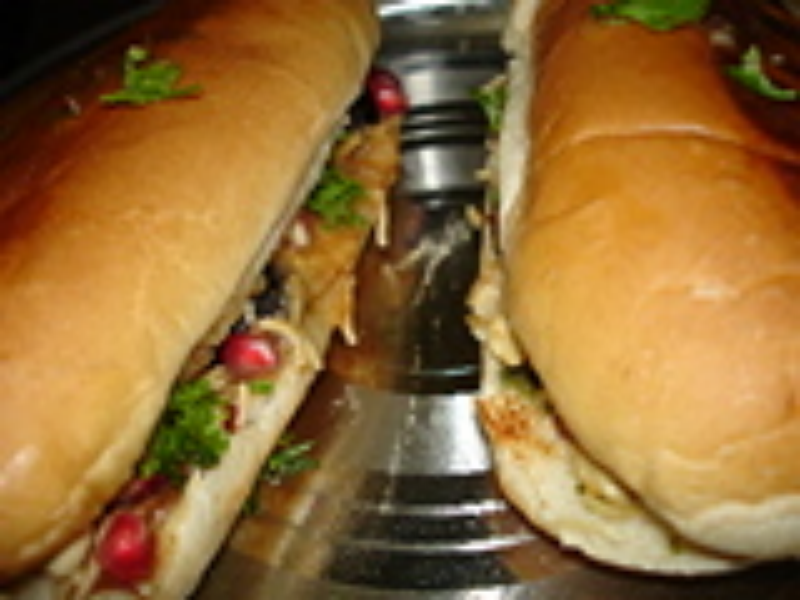 Hi Rajeswari, I love sandwiches any type and this is one of my fav. And thanks for all ur support, I don't mind anyone's comments but hacking and passing comments on my behalf really put me off. Thanks so much.